Donald Trump’s remarkable ability to persevere in the face of seemingly ruinous scandal may be at risk this week, as the uproar over his firing of James Comey gets louder by the day. Now, with the revelation that Trump directly asked Comey to end the probe of Mike Flynn and that Comey documented this request in a memo, the president’s chances of being impeached are surging on betting markets. On the New Zealand–based PredictIt, Trump’s odds of impeachment hit 30 percent Tuesday night after news of Comey’s memo broke. The Irish broker Paddy Power was providing much better odds on a Trump impeachment Wednesday, putting the likelihood at 60 percent. “Paddy Power customers have been lumping on Trump to come undone,” a spokesman told Politico. Those customers will be happy today if they turn their eyes to the House, where more and more members of Congress are uttering the I-word. Maxine Waters, a Democrat from California, has been talking about impeaching Trump for weeks, but others have been reluctant to join her. 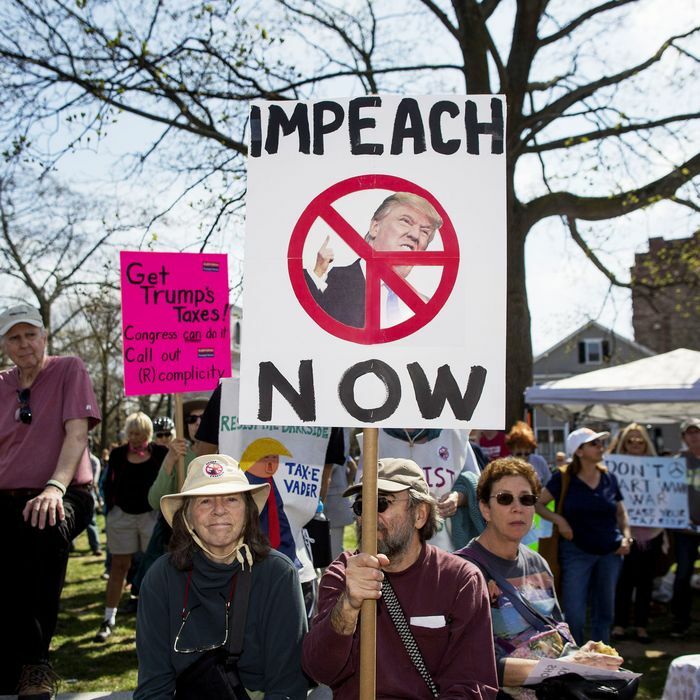 Now, many House members are suggesting that impeachment is coming and saying that if Trump is guilty of obstruction of justice, proceedings should begin. On Wednesday, one of Waters’s Democratic colleagues, Al Green of Texas, joined her in officially calling for Trump’s impeachment. The Houston congressman took to the House floor Wednesday to make his case. More significant than any Democrat’s call for impeachment, though, would be a Republican joining their ranks. And while that hasn’t happened, the topic was broached by Michigan’s Justin Amash on Wednesday, which seems like kind of a big deal.